You don’t have to be a millionaire to love millionaire’s shortbread. This indulgent little treat has it all — a crunchy biscuit base, a sweet sticky caramel centre and a topping of rich chocolate. Now all that normally comes at a high price, being lots of sugar, fat and refined carbohydrates. But now you can enjoy millionaire’s shortbread in all its tasty glory without any of that guilt! This is a healthy high-protein version of the famous shortbread, which replaces the ingredients for healthier alternatives. 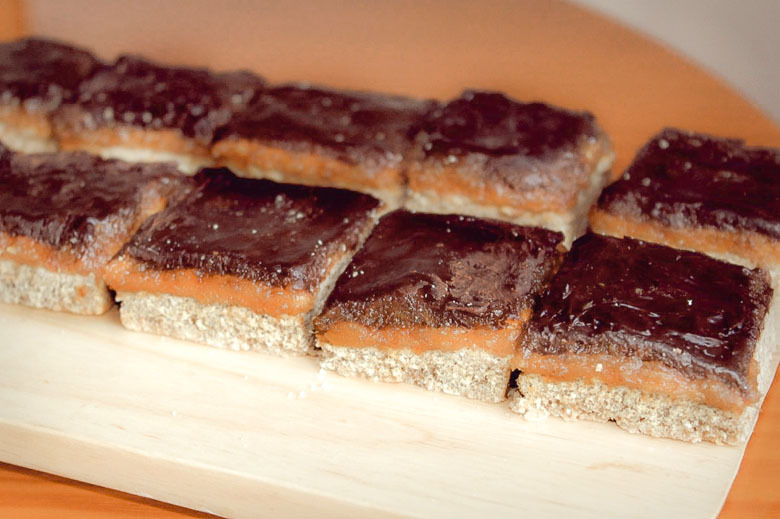 It features a low-carb gluten-free biscuit base and a natural raw caramel that’s free from refined sugars. 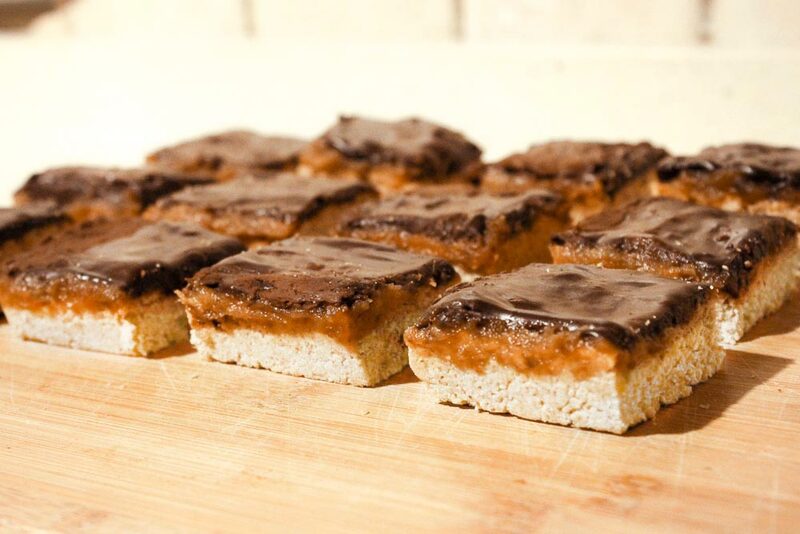 We love to see your versions of our recipes – share your photos and opinions of these Protein Millionaire’s Shortbread bites with us via Twitter (@TrainEatGain) and tag Ashleigh in it too (@ashjvella). * Simply add regular oats to a blender or food processor and blitz into a powder – et voila, oat flour! *Soaking the dates in a bowl of water for a while beforehand (preferably at least an hour) allows them to soften up and helps them to blend much more smoothly. In a bowl, mix the dry ingredients together – oat flour, almond flour, 3 scoops of vanilla whey protein and some cinnamon. Melt the coconut oil in a microwave safe bowl (about 20-30 seconds) and pour it into the flour mixture. Proceed to add the almond milk, honey and vanilla extract and mix it all together to combine. You should end up with a soft but slightly crumbly dough. Take a rectangular or square baking dish and line the bottom with either some non-stick cooking spray or a bit of melted coconut oil. Press the shortbread dough into the bottom of your baking tray to form an even base, approx. 1 inch thick. Bake in the oven for 10 mins, until golden, then set aside to cool. Add the mejdool dates to a blender with almond milk, peanut butter and a pinch of salt. Blend them all together until combined into a smooth and sticky “caramel”. Spread a thick and even layer of the caramel over the cooled shortbread base. Place the shortbread in the fridge for the caramel to set while you move on to prepare the chocolate layer. Slowly melt the dark chocolate with coconut oil in a “bain-marie” (i.e. in a bowl placed over a pot of boiling water). Once it’s all melted together, remove the bowl from the heat and mix in 1 scoop of chocolate whey protein. Now carefully top your millionaire’s shortbread with a layer of the melted chocolate. Place the millionaire’s shortbread in the freezer to allow the chocolate to harden again. 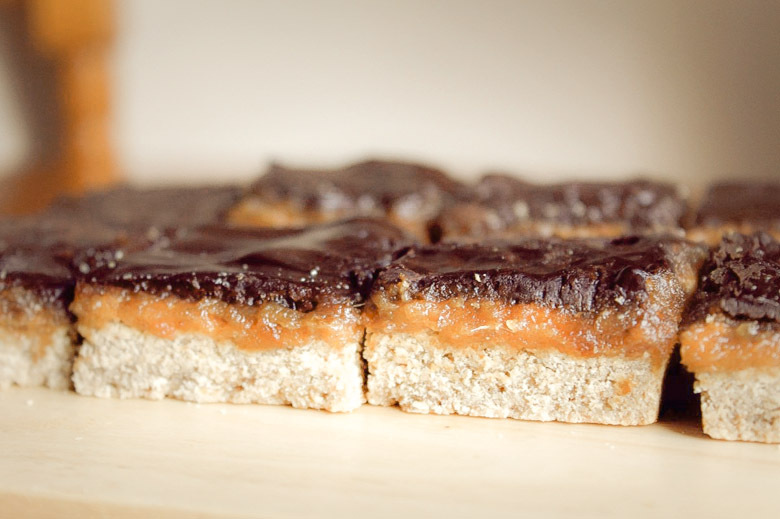 Once all the layers have set, slice your millionaire’s shortbread into squares and enjoy! 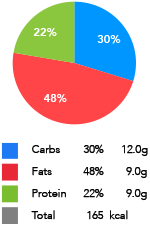 *Note: Macros are given per square, assuming the recipe above is divided into 14 large squares.